In the Trent Green analysis, how will you treat Green's post-concussion performance? Will you project based off of his 2005 stats since that was his last full season or just use projected 2006 stats to project 2007 performance? I've used his last 4 healthy seasons, so I excluded '06. 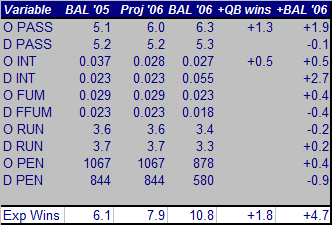 Part of my assumptions are full health for the QB. 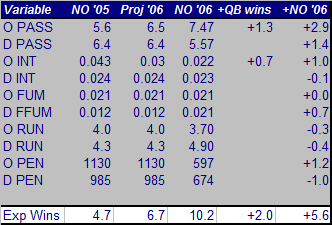 It would be fair to say that's not the best projection, but my goal isn't to predict precisely his '07 performance. I just want to estimate Green's potential for improving the Dolphins. What worries me the most about his '06 stats are his sacks. Willie Roaf. He retired after 2005. I imagine it made a large part of the difference. Honestly, I just want some hope after reading . The window is closing!